Buon Natale! Merry Christmas and happy holidays to all! It's time for our yuletide wrap up - just a quick recap of some of the dishes we enjoyed this season. For Christmas Eve we went with the traditional Feast of The Seven Fishes. My mom hosted and she did a great job. To check our Italian Christmas Eve Menus for the past three years, click HERE, HERE and HERE. 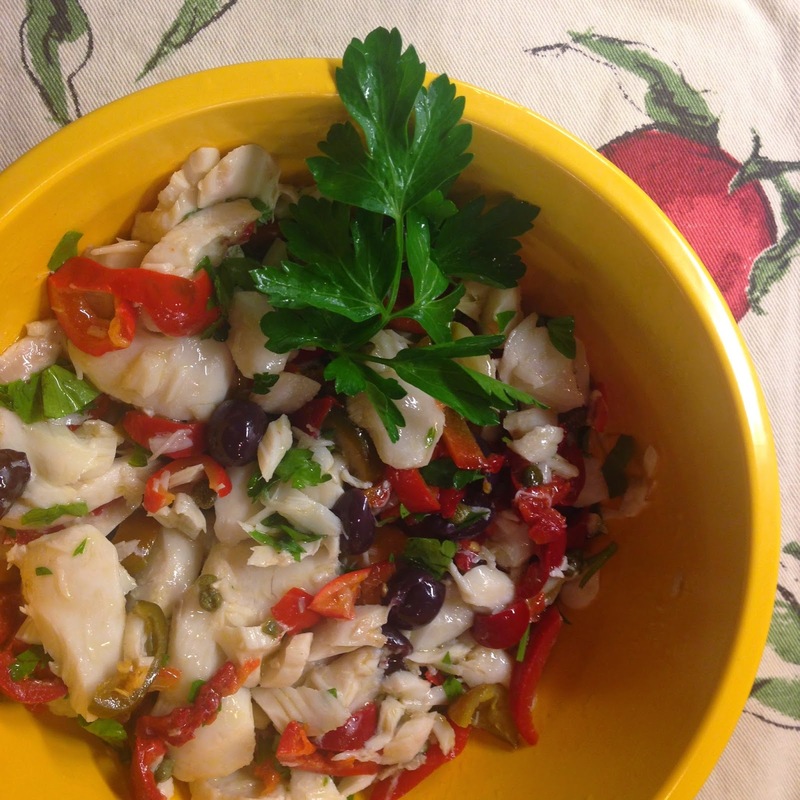 This year, we were treated to smashing seafood salads to kick off the multi-course dinner. I contributed the Baccala Salad pictured to the right. You can find the recipe by clicking HERE. 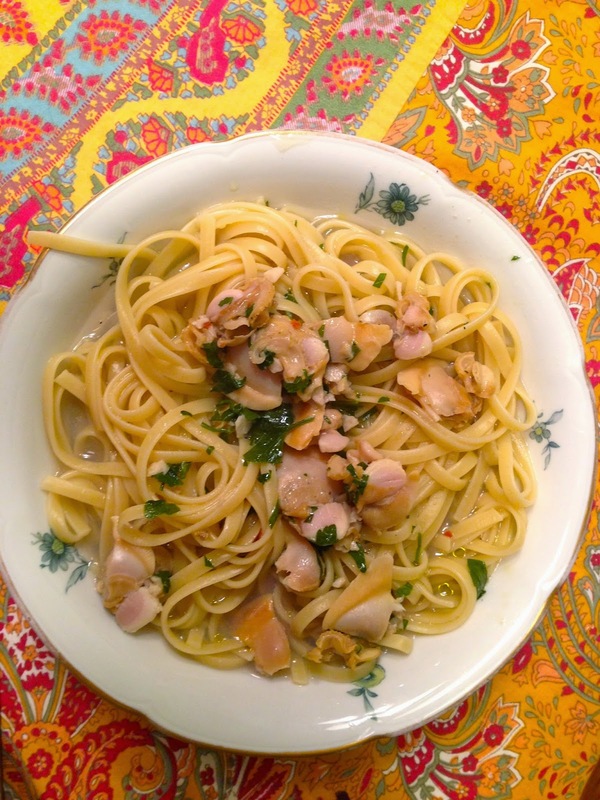 But no seafood dinner would be complete in our family without Linguine with Clam Sauce, easily my favorite dish of all time (recipe HERE), which we often like to follow with a main course of Rao's Lemon Sole, just as in previous years. My mom made super adorably presented goody boxes filled with Christmas Cookies. 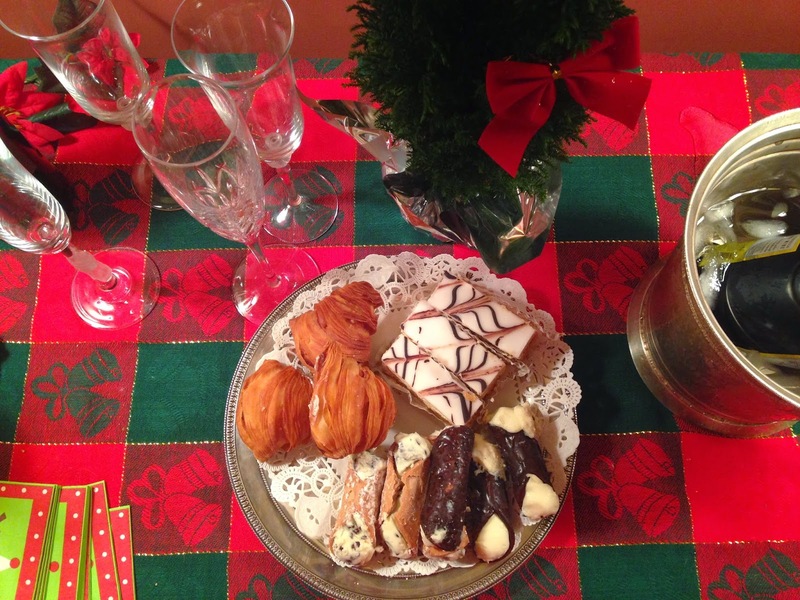 For dessert, we kept it simple with delicious Italian Pastries from an excellent bakery called Natale's. We need to leave space for Christmas Dinner, you know? Speaking of Christmas, my mom in law made it tasty as ever. 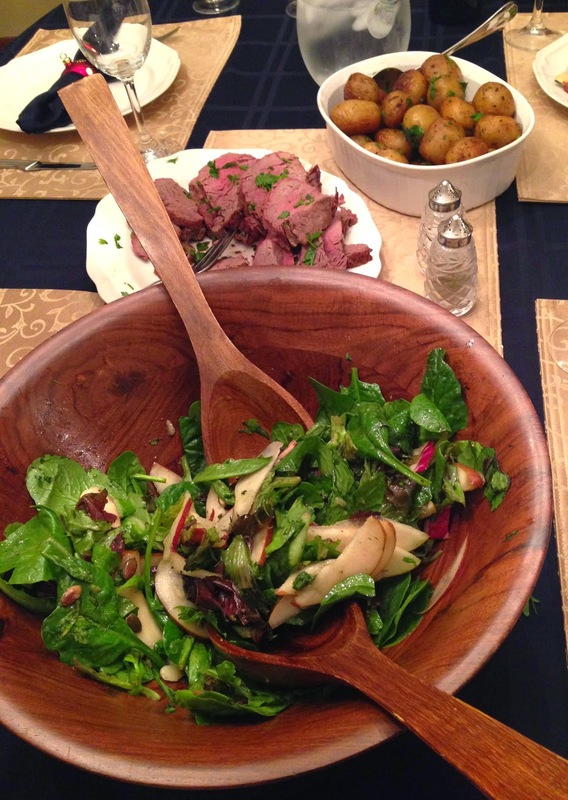 We were treated to, among other things, a lovely Filet of Beef and a really great Salad with Red Pears and Pumpkin Seeds - I am surely going to try and recreate it some day. And there you have it, as fast as it came to us, Christmas was complete. 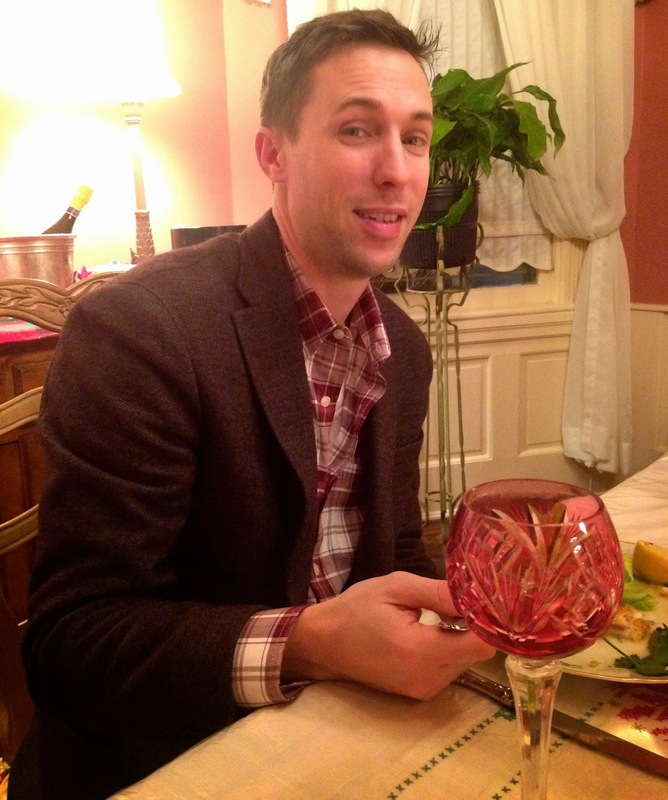 I hope you too enjoyed a holiday season filled with only good things and good food. Here's to lots more cooking in the new year! My name is Samantha, and I am addicted to Hershey's Special Dark Cocoa. It's true. I never considered how sinfully good this Cocoa could be, until I got this idea to make Dark Chocolate Brownies. They were such a success (and so simple that I've easily made them 5 more times since I first created the recipe), I thought I might apply the same logic to a majorly alluring dessert I'd come across. You see, my thoughts of late have been consumed by cake, Chocolate Stout Cake, to be exact, from a bakery called Ovenly in my hometown of Brooklyn. It's called Brooklyn Blackout and it's made with Brooklyn Brewery's Chocolate Stout. Wanna see it? Hold onto your seat and click HERE. I mean, you could probably just die happy now, am I right? Chocolate Stout is the secret sauce. Alongside rich Dark Chocolate Cocoa and a dollop of molasses, it's what makes this amazing cake so deeply chocolatey. 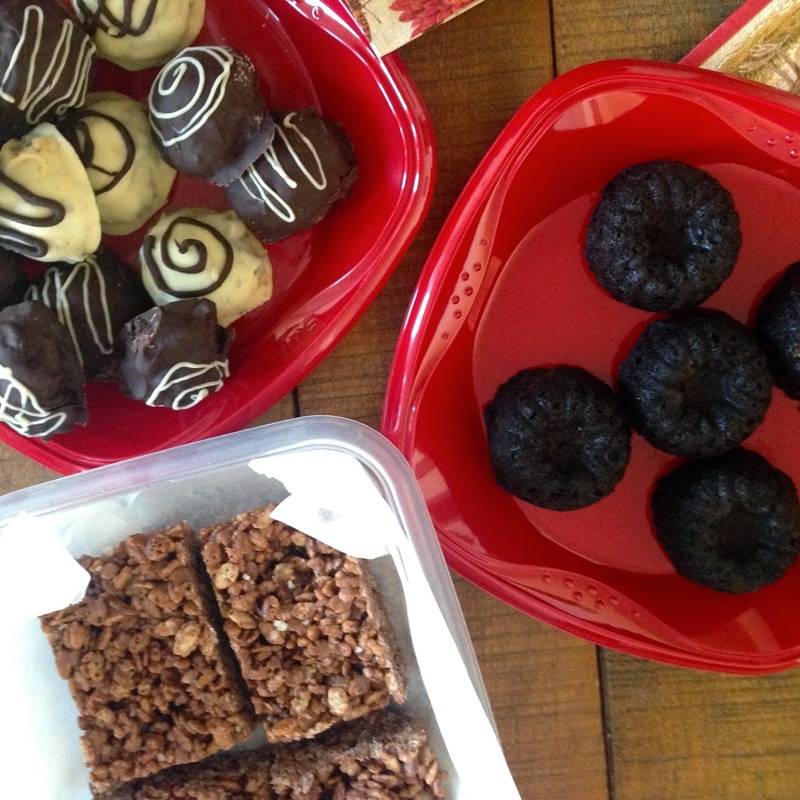 Because it is the season for holiday gifts of food (check out last year's homemade sweet), I decided to create a mini, giftable version of Ovenly's insanely good confection. 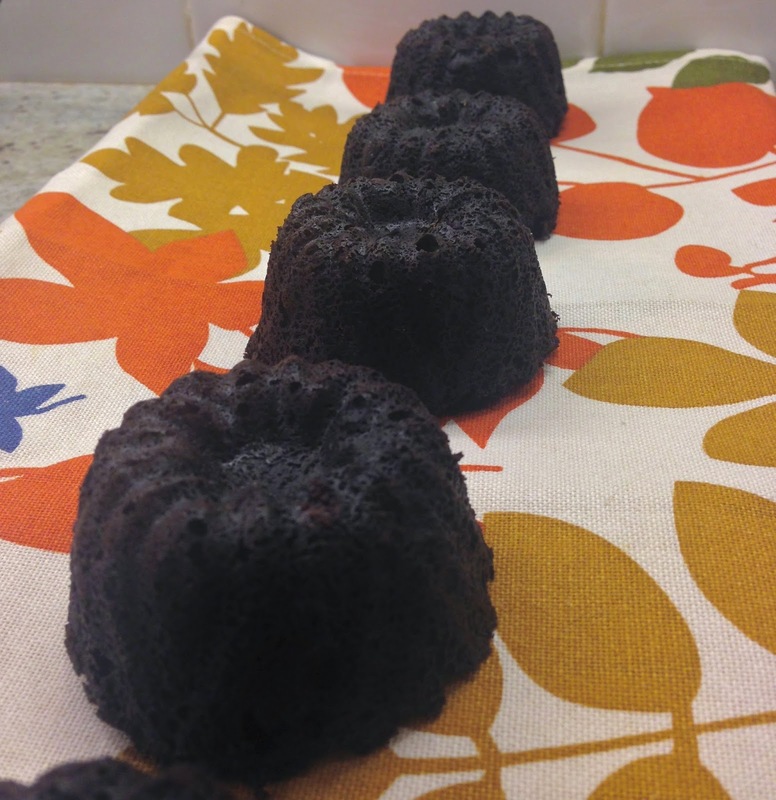 These Dark Chocolate Stout Mini Bundt Cakes would be the perfect treat for the special people in my life. 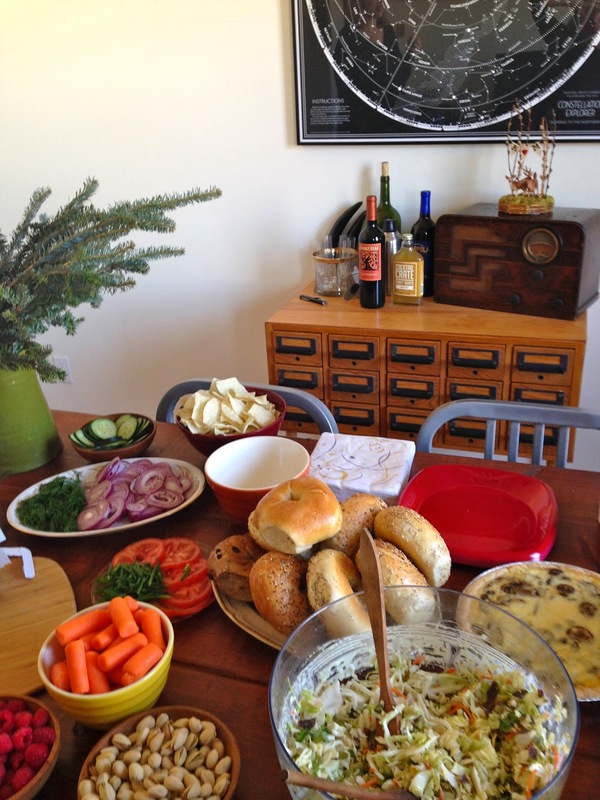 Good thing several of those special people were all in one room just yesterday for our annual holiday potluck brunch. The event would be the perfect chance for me to lightly adapted Fine Cooking's recipe for Chocolate Stout Cake. I put my own stamp on it by adding Dark Cocoa and chunks of good quality Bittersweet Chocolate. I also amped up the Chocolate factor by using Chocolate, rather than regular, Stout. In a pinch, Guinness or something similar would work just fine in this but why not go for double the Chocolate beer-y goodness?? I opted not to glaze these already rich minis with ganache, although I am sure that would be heavenly. A simple dusting of Confectioner's Sugar would be a nice touch too. Whatever you decide, you won't be disappointed by the deeply decadent flavor of these cute little cakelets. Important Note: our mini bundts were made in an extra small individual "bite sized" Bundt Pan. Cook times will vary a bit depending on the size of mini bundt pan you use. Of course, the original recipe is for one large Bundt, so that's always an option if you are making it for a single recipient (or better yet, you! ).You can even line cupcake pans with paper liners and bake this batter cupcake style. If you do so, I world recommend glazing or icing them. Cream Cheese Icing feels like the right move. is being able to share it all with your best friends. Optional Glaze: 3/4 Cup Heavy Cream & 6 Ounces Semisweet Chocolate. Click HERE for the how-to. 1.Remove Eggs from the fridge and allow Butter to soften to room temp. 2. Set a rack in the center of the oven and preheat to 350. 3. Butter your mini or large Bundt Pan and lightly dust with Cocoa. 4. In a small pan over high heat, bring Stout and Molasses to a simmer. Turn off heat and let stand. 5. Into a large bowl, sift Flour, Cocoa Powder, Baking Powder, Baking Soda, and Salt. 6. Using a stand mixer or handheld electric mixer, cream the Butter until very smooth, approximately one minute. With the mixer on medium, beat in in Brown Sugar until fluffy, about 3 minutes (scrape down the bowl once or twice during). 7. Now beat the Eggs into the Butter mixture, one at a time, stopping to scrape down the bowl after each addition. 8. Turn the mixer to low speed and alternate adding the Flour mixture and Beer Mixture to the bowl, beginning and ending with Flour. Scrape down the bowl periodically, and put the mixer on medium for thirty seconds at the end to ensure the batter smooth. Stir in the chopped Chocolate. 9. Pour into pan, smoothing the top with a spatula. If using Mini Bundt Pans fill only 3/4 of the way at most. The batter will rise as it bakes. If there is any overflow, the bottoms of the cakes can be easily trimmed off after cooling. or for a large Bundt, cook time will be more along the lines of 40 minutes but check it at 35 minutes. ~You will know it is done when a toothpick inserted in the middle comes out clean except for a few moist crumbs. 10. When cake is finished, invert onto rack and transfer to a platter. Best served slightly warm. Hopefully you too are coming down from the glorious food hangover that is Thanksgiving. While we all know that the Turkey is supposed the main event, there are many of us that look forward just as much to the apps, sides and other accoutrements that make the meal so memorable. This year, I decided to chronicle our household's contribution to an already smashing family feast. You'll find one Neurotic Kitchen hors d'oeuvre favorite, two new and different small bites that we tried making for the first time, and last but not least, my husband's traditional contribution to Turkey Day, and the ONLY Mac and Cheese recipe you'll ever need, Martha Stewart's Perfect Mac and Cheese. 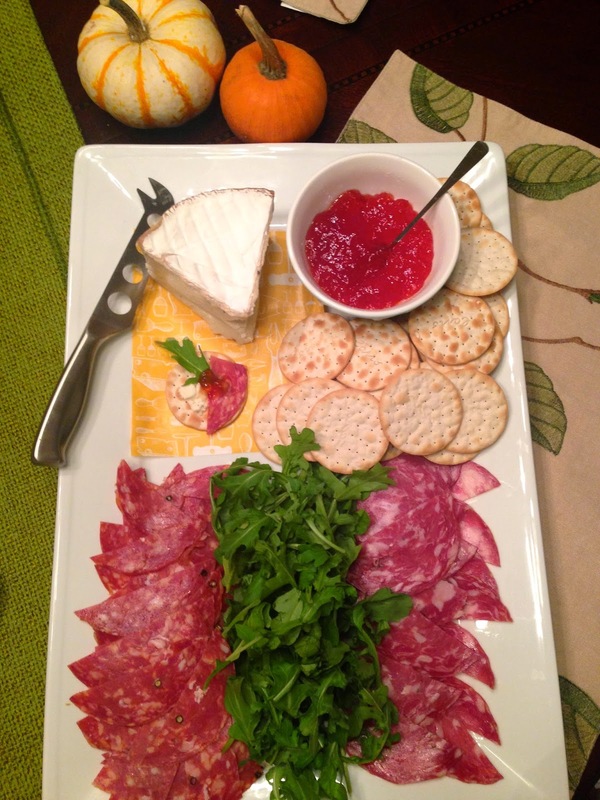 First thing's first: when your don't have time to assemble each hors d'oeuvre, why not create an equally lovely "make your own" platter. 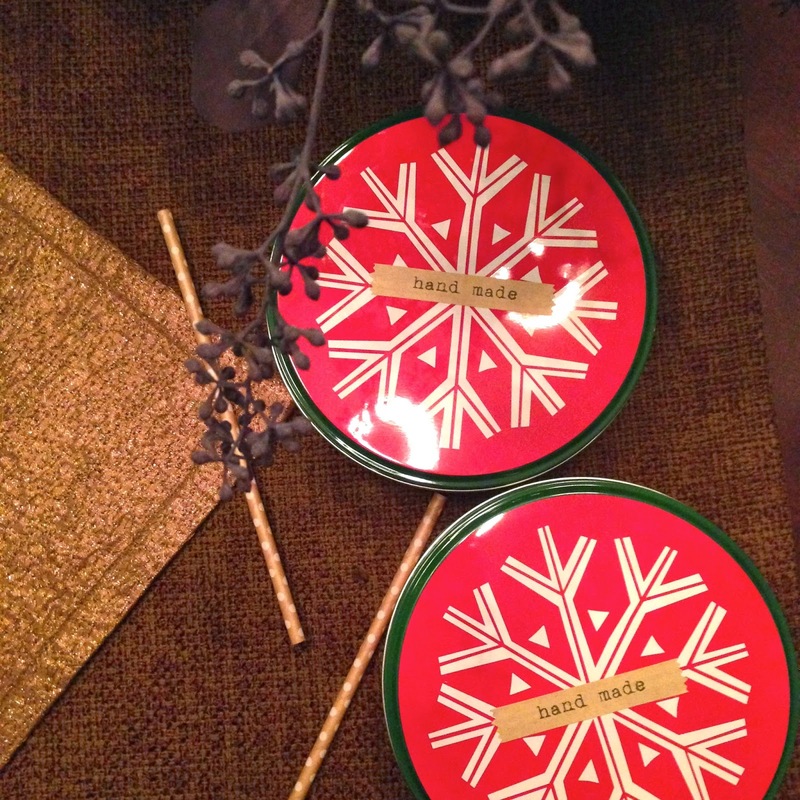 Be sure to include a little card with the "how to" for guests so they know how to assemble. Pictured above is our quickie, deconstructed version of NK's very popular Soppressata, Truffle Goat Cheese and Pepper Jelly Crostini. It was tasty as ever. Next up, I was really delighted with the results of my first time trying Ina Garten's Blue Cheese and Walnut Crackers. 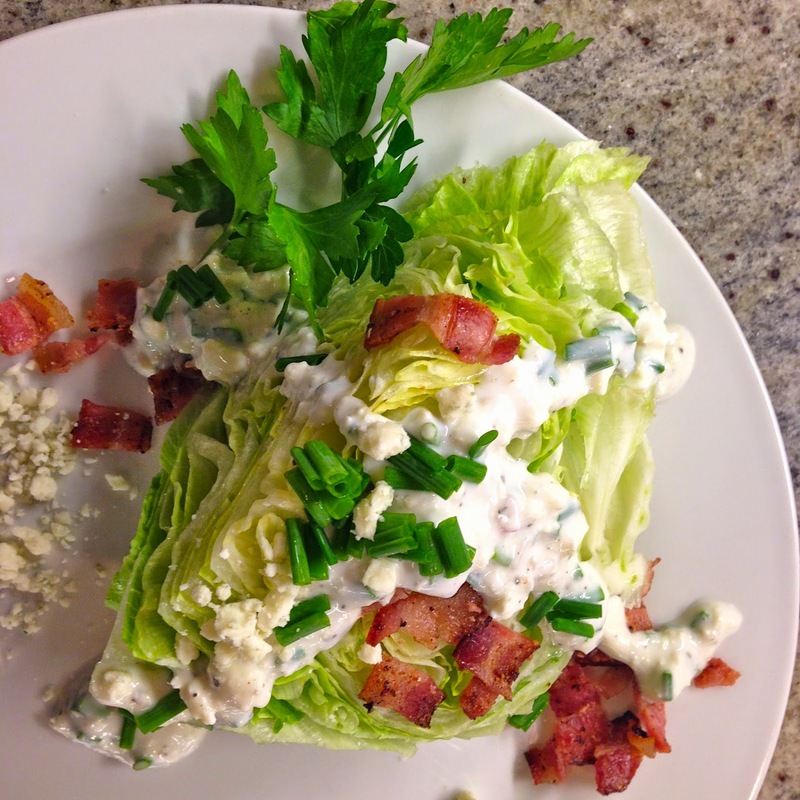 So savory and easy, these are made using good quality Blue Cheese, in this case, Stilton. I was able to mix up the very simple cracker dough several days before Thanksgiving. You simply roll it in a log and freeze it. When ready to serve just slice and bake! I chose to bake them a day ahead to minimize my Turkey Day morning workload. These crackers need no accompaniment as they are really flavor-packed and hearty just as they are. Check them out below and click HERE for the recipe. It was our third small bite (pictured at the top of the page) that got the biggest raves from the hors d'oeuvres table - my adaptation of Athena Calderone's Ricotta and Roasted Grape Crostini. Roasting deepens and concentrates the flavor of Grapes, and fine quality fresh-made Ricotta (we just love the artisan Ricotta from Salvatore BKLYN) is the perfect creamy foil. My changes to the original recipe included using finely chopped Pecans instead of pricey Pignoli (Pine Nuts), and Fig Balsamic Vinegar rather than regular Balsamic for a little extra flavor dimension. 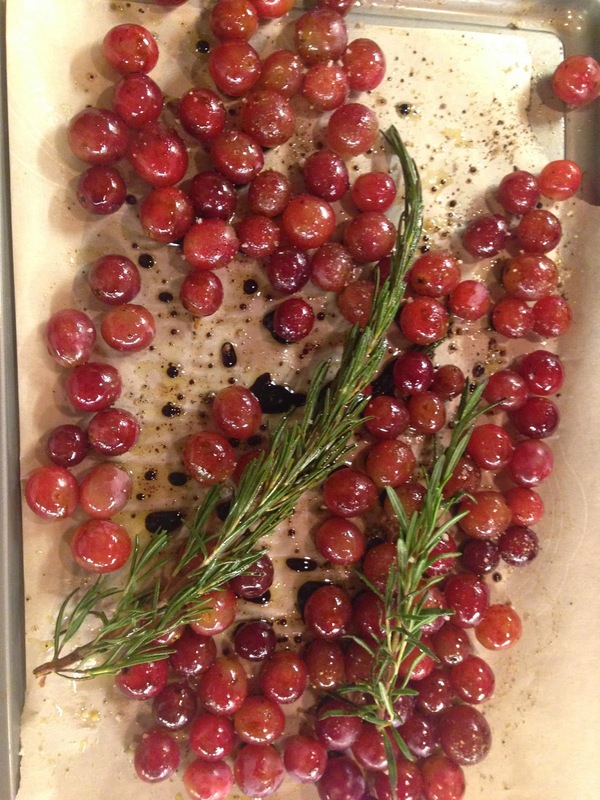 I roasted the grapes Thanksgiving morning and put the crostini together at our host's house, just before guests arrived. I also opted to use French Grey Salt over regular Sea Salt. I would absolutely make this wonderful recipe again. It tasted as beautiful as it looked! Finally, the main event: turkey and lots and lots of sides. Our addition to the impressive spread my Mom-in-Law made was Martha Stewart's incredibly decadent classic, Perfect Mac and Cheese. This stuff should come with a warning label. It is that good. So addicting, in fact, that we affectionately refer to it as "Crack and Cheese." The secret? An ungodly amount of Cheddar and Gruyere plus a crunchy topping of toasted breadcrumbs (chunks of fluffy white bread soaked in butter creates the decadent crispiness). Do not miss this dish or attempt to alter the recipe. It is perfect, just like its name. Do note that you will end up with a ton of cheesy goodness (a plus, in my book), so if you aren't serving a crowd and do not want tempting leftovers (why??) you may opt to cut the recipe in half. One more Thanksgiving in the books! I hope you've enjoyed our recipe roundup and that your holiday was filled with happiness, family, and wonderful food! Though Quinoa has dominated the national food conversation for quite some time, there's an upstart grain that's gaining steady popularity, and though it may seem newly on the scene, Farro is as old as they come. Ancient, in fact. Much of my education on Farro comes from this wonderful article I found on NPR. It was here that I learned that there are really three varieties of Farro, and that their differences are determined by whether or not the bran has been removed. 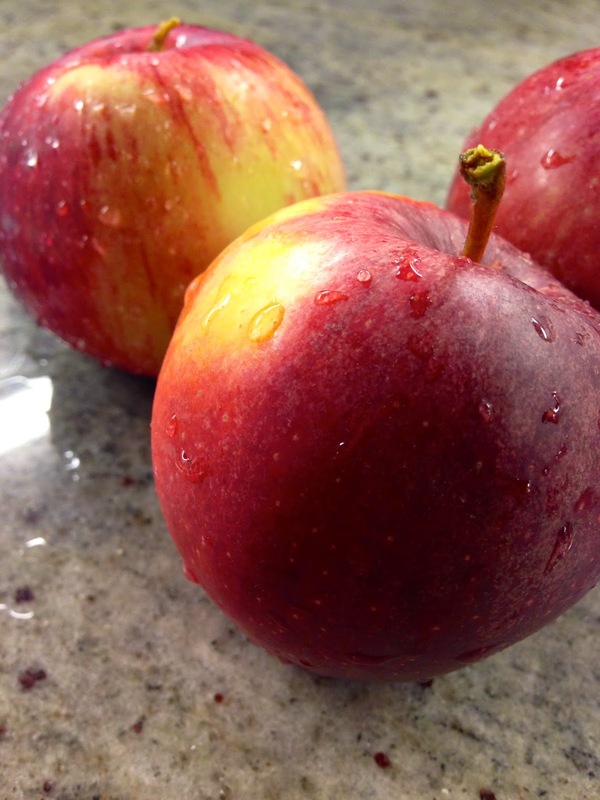 We'll be using the Emmer Variety, which is the most common and best if you're looking for a shorter cook time. Aren't we always? Emmer is also known by its Latin name, triticum dicoccum. Farro has an especially rich history - it is the grain from which many others sprung, and it served as the primary food of the Roman Legion. You might imagine it to be a pretty special grain if it could nourish an army. Indeed, the health benefits of Farro are many. Preparation-wise, it's just as versatile as rice, and it cooks -and looks- a lot like barley. Your can serve it on its own, add it to soups or toss into salads, as we are about to do today. Especially adept cooks might like to transform it into risotto. Our hearty Farro Salad will get a little extra flair from the addition of Purple Carrots, a colorful variety of the more common veggie that I've recently discovered. Like Farro, Purple Carrots go back in time quite a ways themselves. 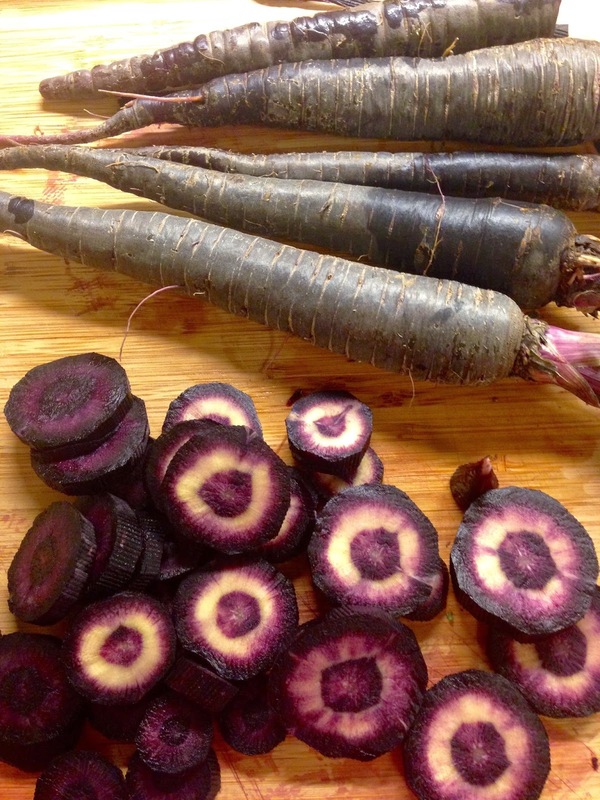 In fact, all carrots were originally purple before being bred to be the orange roots that we recognize today. Why would they ever want to change these beauties? Gorgeous though they may be, this carrot variety is incredibly healthful as well.Their deep purple color is thanks to anthocyanins, the antioxidant compounds responsible for the deep hue of Blueberries and their super nutritious status. Peppery Arugula, another nutrient powerhouse, anchors our salad while a bright Orange Vinaigrette offers a subtle punch. Salty Pecorino Romano lends the round note to complete this satisfying melange of flavors. An ideal potluck, picnic dish, or make-ahead lunch, this Farro Salad tastes even better left over once seasonings truly marry. Farro is a sturdy grain, too. Make it ahead and it will keep its texture and pleasant chewiness until you're down to the last bite. Enjoy! 1. Combine the Farro and Water in a medium saucepan and add the Kosher Salt. Bring to a boil over a high flame. Reduce heat to a medium flame and simmer, covered, for about thirty minutes. Set Farro aside and allow to cool a bit. 2. 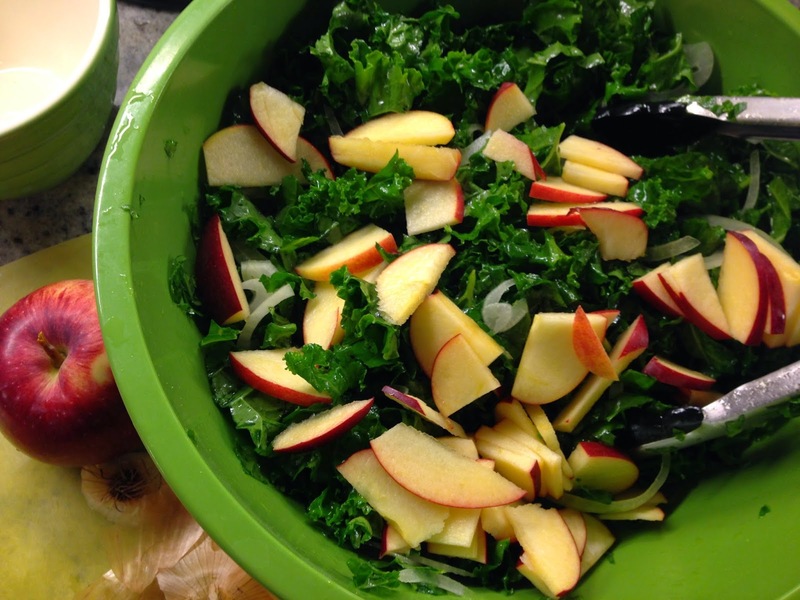 Combine the dressing ingredients in a small bowl. 3. Toss the Farro with the Arugula, diced Carrots, and Pecorino Cheese. Slowly pour the dressing over, tossing gently until well incorporated. Ideally, allow this to sit at least a half hour. If you need to serve it right away that's ok too. Taste for Salt and add a few turns of freshly ground Pepper. Serve and enjoy! We're doing it! More pumpkin-infused treats. This week, we tested out a scrumptious looking Pumpkin Coffee Cake with Pecan Streusel recipe from Williams Sonoma. I was recently reminded of the joys of coffee cake when my Mom-in-Law brought us an Entenmann's from the supermarket. I hadn't had one in at least ten years, and though we all agreed that the cake, like many packaged foods, looked much smaller than we remembered, the taste was still pretty great. It was probably on my third trip to the kitchen to surreptitiously siphon off another sliver that I realized that I was obsessed. Why? The salty, buttery, crumbly streusel topping. Could I recreate this sort of goodness at home and would pumpkin have a place in the mix? Turns out, yes! Not only was the Williams Sonoma recipe easy, even considering that baking is not my strong suit, but the addition of canned Pumpkin worked very well. If you are looking for a quick baked good to bring to Thanksgiving, or even something for your post-turkey coma brunch, this cake would be a great choice. I didn't alter the recipe at all except that for the streusel, I subbed in Salted Butter because for me, the salty-sweet quality of Coffee Cake's crumb topping is what makes it sublime. Enjoy with or without your next cup of joe! I don't know about your house but around here, two frozen Italian Sausage links do not a dinner make. When I'm faced with odd amounts of ingredients leftover from other recipes (1 chicken leg, anyone? ), I try and challenge myself not to let them go to waste. I've found using them as a springboard for new meal ideas is a great strategy. That's why when pasta night rolled around (we need our fix about once a week), I took to the web to find a Sausage Ragu recipe worth trying. 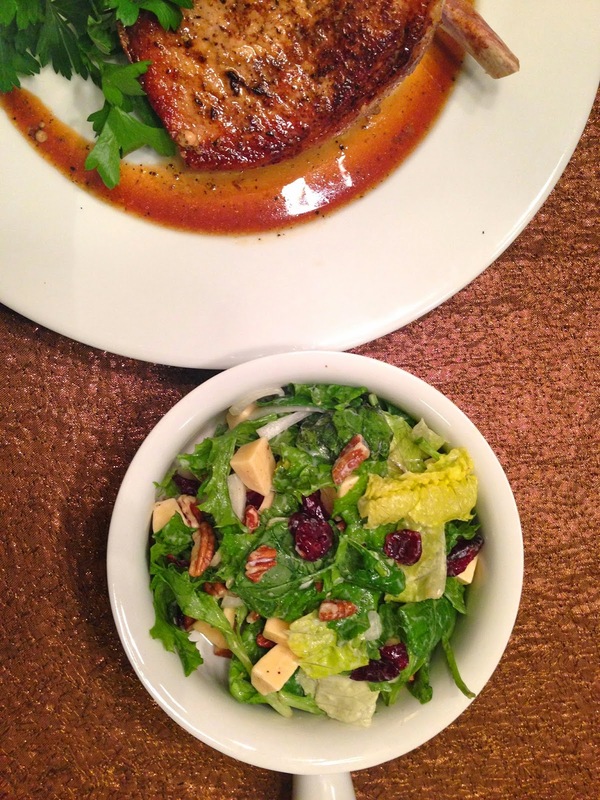 Not surprisingly, I landed on a familiar place for inspiration, Lidia Bastianich's website. Our light adaptation of Lidia's Rigatoni with Sausage Tomato Sauce would provide us a great opportunity to use some of the pantry and freezer items we had on hand (it's never a bad idea to have cans of whole tomatoes at the ready for sauce making). As with many ragu recipes, Lidia's is rather long-cooking. As such, we've tweaked the preparation considerably to make this more along the lines of a 45 minute cook time (down from an hour and a half). What does this mean for you? 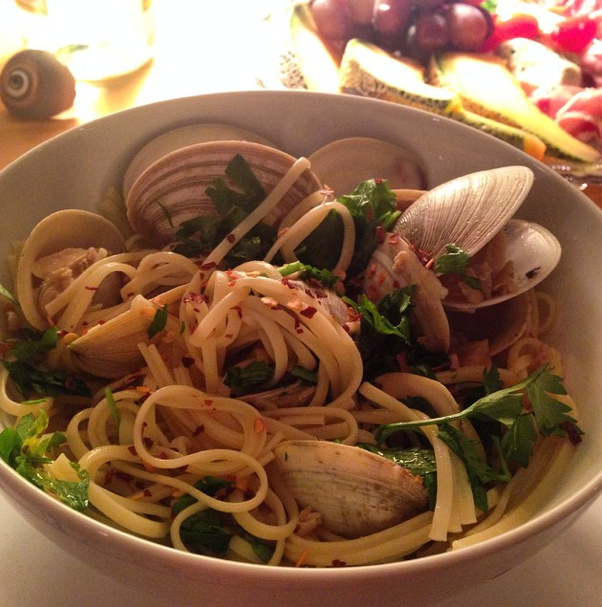 Well, for one, you can make this on a weeknight when you've got a little time to spare. Do certainly try the longer technique when you have time, but we managed to achieve fairly well-developed flavor and richness with minimal effort, and that's just how we like to roll on work days. 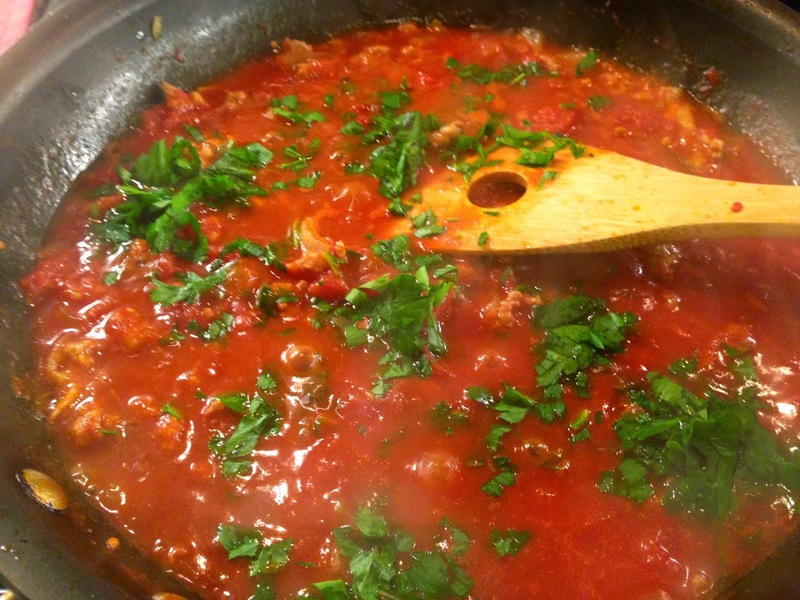 Purchasing fresh herbs like Basil (we also added minced fresh Parsley to mix) and using good quality canned Tomatoes and Italian Sausage is the key to achieving a very flavorful sauce fast. And, if you don't happen to have a bottle of wine open, you now have an excuse! Weekday be damned! Now for pasta talk; we used a fun but hard to find pasta shape called Strozzapreti. It looks like a longer version of Cavatelli and interestingly, the name means Priest Stranglers… eek! Of course, any short, spiral pasta would be a worth vehicle for this satisfying sauce. 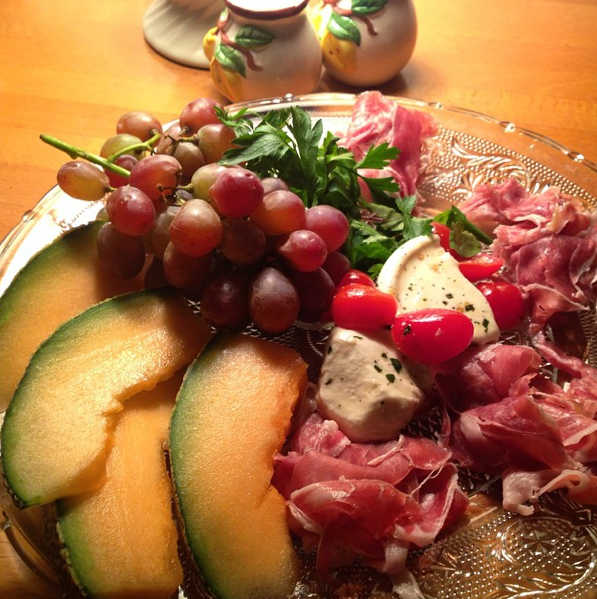 Buon Appetito and enjoy! 1. Remove the Sausage casings and discard. Crumble the Sausage meat into a medium bowl. Now pour half of the wine over (1/4 cup) and stir to be sure the meat is evenly moistened. 2. In a large skillet over medium heat, drizzle the Olive Oil. Add the Onions and cook until they start to soften, roughly 5 minutes. Now add the Garlic and Crushed Red Pepper Flake, stirring well. When everything is sizzling, pour in the Sausage Meat, breaking up any chunks. Stir well. 3. To the skillet, add the remaining 1/4 cup of Wine and turn up the heat to medium-high. Cook, stirring frequently, as the wine cooks down and the Sausage begins to brown, approximately 10 minutes. 4. At this point, you'll want to start preparing your pasta in boiling salted water according to the package directions. Drain it and set it aside. You can also make it in advance of the sauce if easier, just save some pasta water or a bit of oil to help unstick it if necessary. 6. Turn off the flame and scatter the Parsley throughout the sauce. 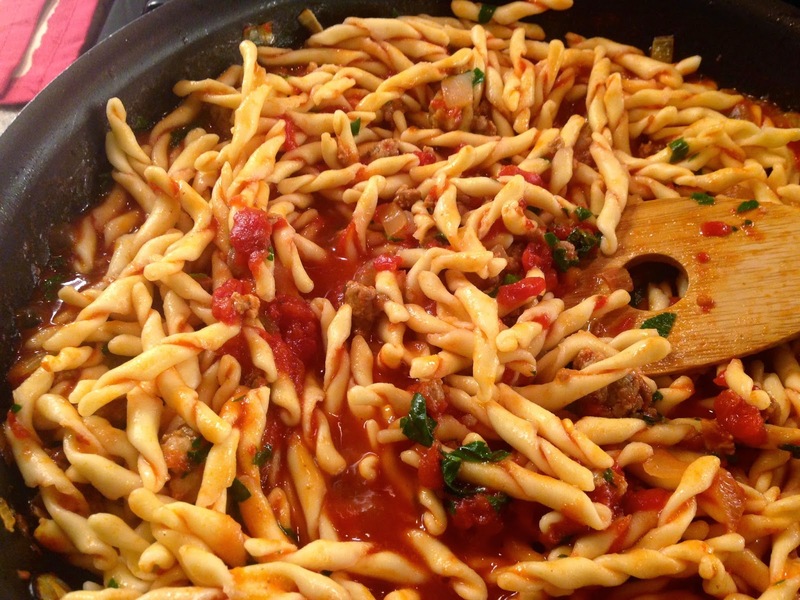 Add the drained Pasta to the skillet and toss to incorporate until sauce is well distributed. Finally, add about half of the grated cheese to the skillet and toss until incorporated. Taste for seasoning and adjust if needed. 7. To serve, plate the pasta and sauce and drizzle each serving with a little Olive Oil. Next, optionally garnish each bowl with a few Basil Leaves. Pass the remaining grated cheese around the table. There's absolutely no reason an elegant dinner can't also be easy and fast. Whether you're up for treating yourself to a fantastic home-cooked meal or preparing to entertain a special someone, it's always nice to have a perfect (and perfectly simple) recipe in your back pocket. 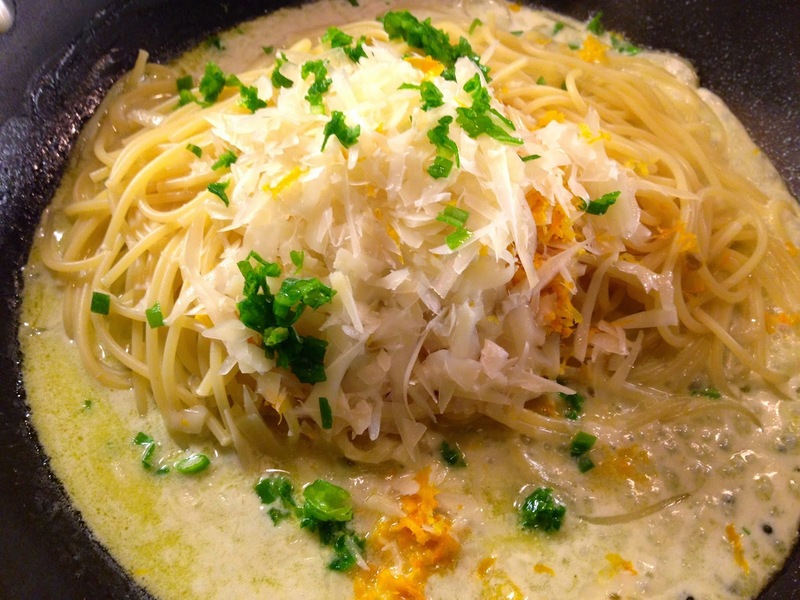 To that end, we'd like to introduce you to this sensuous plate of Meyer Lemon & Cream Spaghetti. 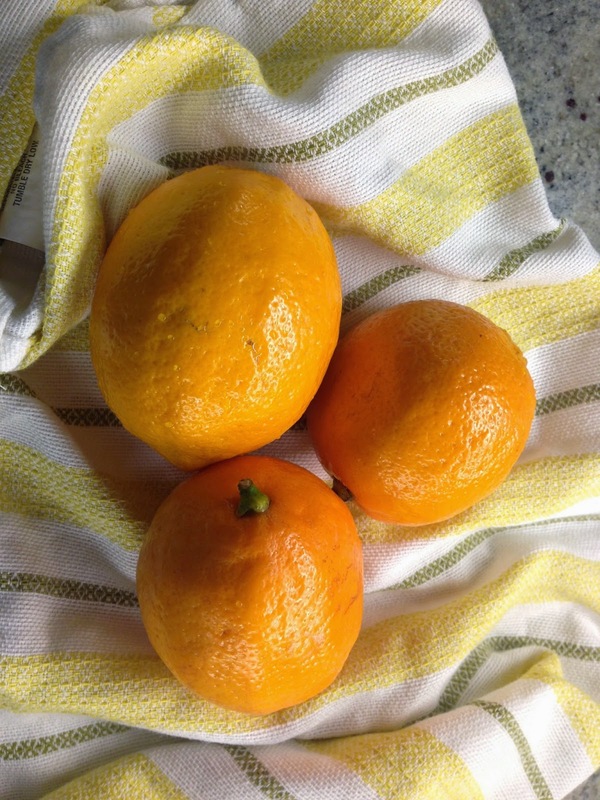 With just a few easy to find ingredients (regular Lemons work just fine if you can't find the milder, more floral Meyer variety) it comes together very quickly and is, I assure you, impossible to mess up. Just be sure to have your mise en place set up before you begin because the process, though simple, is very time sensitive. The dish you'll create is absolutely scrumptious and very worthy of a company meal. It makes for a fantastic vegetarian pasta course and works in every season. Note: Before you start, chop, measure, and prepare all your ingredients before you begin the cooking process! 1. Boil Spaghetti according to package directions in well salted water. 2. When the Spaghetti is about halfway finished, you'll want to start the sauce. In a large sauté pan, whisk the Oil, Cream, and Wine. Turn the flame to medium-high so that the mixture comes to a simmer. Leave it simmering about 3 minutes, whisking now and again. 3. Once the Pasta is finished, drain it and add it to the sauté pan. Toss in the Lemon Zest, Lemon Juice, and Cheese. Blend by gently yet thoroughly tossing. Add the minced Parsley and toss again.Taste the pasta for Salt and add a sprinkle if needed. 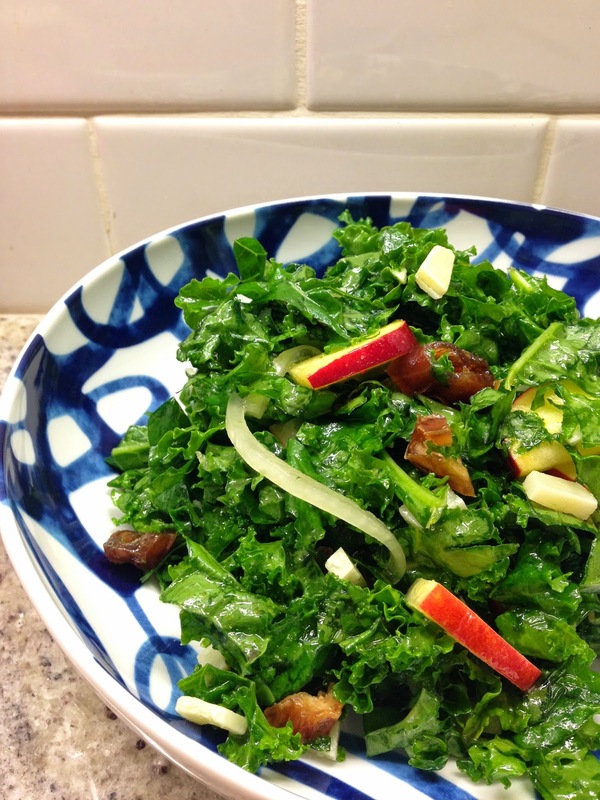 You can also include extra Lemon Juice or Cheese if desired.